Jason Marsalis delivers the instrumental Jazz goods on his latest release, Jason Marsalis and the 21st Century Trad Band - Melody Reimagined: book 1 released on the Basin Street Records label. Featuring Jason Marsalis on vibes, Austin Johnson on piano, Will Goble on bass, and Dave Potter on drums, with special guests: father Ellis Marsalis on piano, and brother Delfeayo Marsalis on trombone, this release is sure to set vibe fans' hearts afire. 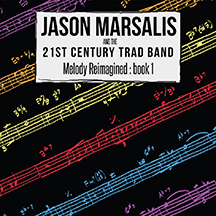 Jason Marsalis and the 21st Century Trad Band - Melody Reimagined: book 1 was produced by Jason Marsalis and Executive Producer Mark Samuels and released on the Basin Street Records label. Jason Marsalis wrote all compositions on the release, which coincides with the 20th anniversary of another New Orleans major talent - Basin Street Records. From New Orleans, Louisiana, the Marsalis family is music royalty: father Ellis Marsalis a talented pianist and music educator, and his four tremendously talented sons are: trumpeter Wynton (Jazz at Lincoln Center), saxophonist Branford, trombonist Delfeayo, and youngest son, Jason, who began playing violin as achild, and plays drums and vibes. Having reviewed previous Marsalis family releases including Jason Marsalis Vibes Quartet - In a World of Mallets, Irvin Mayfield and Ellis Marsalis - Love Songs, Ballads and Standards,and Irvin Mayfield - A Love Letter to New Orleans on which both Ellis and Wynton play, I knew this release by Jason Marsalis was going to be something special, and it is. Jason Marsalis writes in the liner notes about the album: "On various shows I've done as a leader, original compositions would bemixed with standards for the setlist. Spontaneous arrangements would evolve to spice up the standards. As these standards would evolve into originals, a concept for an album was born; original compositions based on the harmonic structure, or chord changes, from other songs. In previous years, harmonic structures from the standard American songbook would be used to create new melodies. For example, Duke Ellington's "In a Mellow Tone" is based on the harmony from "Rose Room," while Charlie Parker's "Ornithology" is based on the harmony from "How High the Moon." For this album, harmonies from not only the American songbook are utilized, but jazz standards, traditional jazz, and even1980's pop music contains chord changes to inspire new pieces. We hope that this will be a fresh and familiar experience for the listener." The 9-track release opens with the track, Ratio Man Strikes Again, with Jason Marsalis leading brightly on the vibes, complemented by Austin Johnson working his talent on piano on this lively up-tempo rhythm that sets the note of excellence for the release. Next on the playlist is Off the Rails, with its rolling vibe rhythms like a soft caress, that lead into some fine drumming by Dave Potter, and Will Goble picking at the bass. The band slides into Just as Cool as the Other Side of the Pillow, which is 9 minutes and 38 seconds of pure excitement with its heavy bass opening by Will Goble, that segues into a complementary duet of Jason Marsalison vibes and Austin Johnson on piano, with an underscoring bass melody. The release continues with Soot Sprites,a stunning, catchy rhythmic walk in the park. The band takes it slow and easy on A Peaceful Silence with some beautiful piano segments, then Jason Marsalis gives a nod to New Orleans with Bourbon Street Ain't Mardi Gras, whichis jazz that cooks so fine and shows off the talent of the ensemble working together to blend their instruments into a phenomenal composition. Passionate Dancer allows the listener to relax and enjoy the rhythms, followed by the letter perfect, Never Forget the 23rd Letter. Listeners are treated to the full-on pedal-to-the-metal talent of the Marsalis familywith Jason on vibes, Ellis on piano, and Delfeayo on trombone on the last track of the release, entitled 80. The composition opens with Ellis Marsalis showing his effortless mastery of the piano with Delfeayo layering in some exceptionally fine trombone, complemented by Jason Marsalis on vibes, Will Goble on bass, and Dave Potter on drums. With his latest release, Jason Marsalis and the 21stCentury Trad Band - Melody Reimagined: book 1 Jason Marsalis firmly establishes his mark as a celebrated composer and exciting vibes artist. Websites where you can procure Jason Marsalis and the 21stCentury Trad Band - Melody Reimagined: book 1: Basin Street Records,and Amazon. © January 2018. Luxury Experience. www.LuxuryExperience.com. All rights reserved.